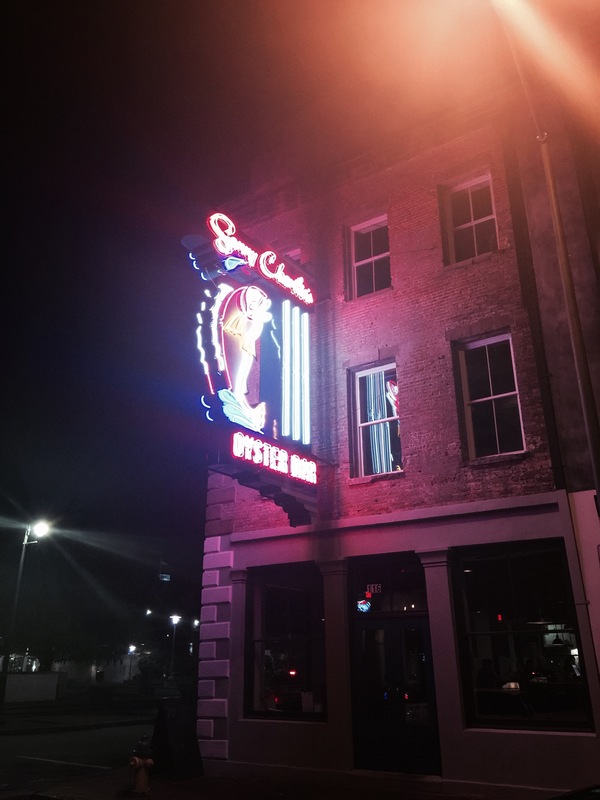 MEGabite “Tasty Tuesday” post is concentrating on a few spots in the historical area of downtown Savannah, Georgia, and one place outside of this district. Not interested in Savannah food? Skip this post. Short attention span? Skip this post. Going to Savannah? Read this post. I’m not a chef or a food critic. Just Meg. 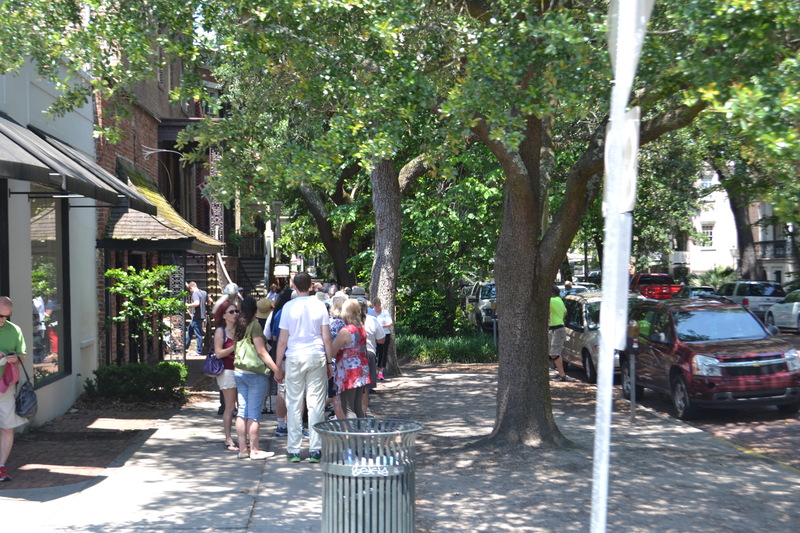 Savannah was listed as ‘The Best American Cities For Foodies”-Conde Nast Traveler, May 2014. 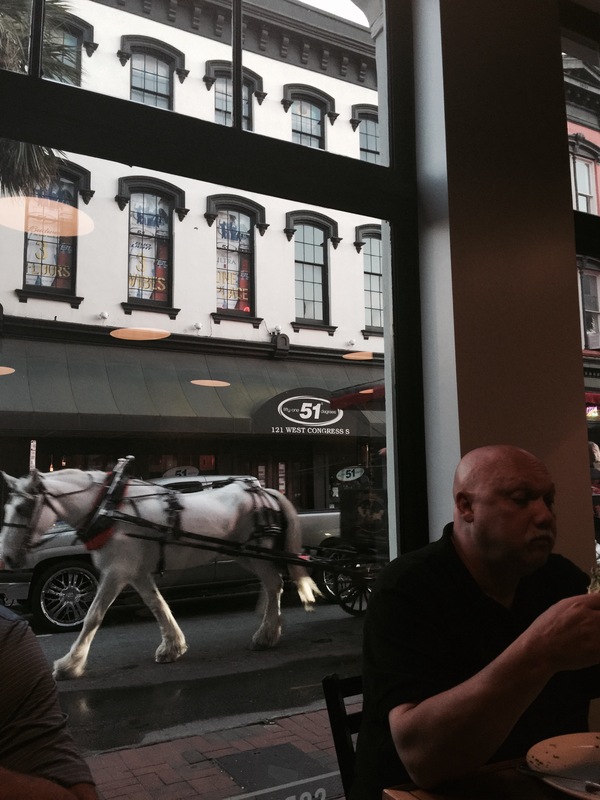 One thing that I love about Savannah is that you can enjoy fine dining in casual attire. So here is what Ms. Pacman tried on this visit. 1. Garibaldi’s Escape Restaurant or Garibaldi’s Cafe. I was invited to a dinner with six others, meaning I got to try quite a few dishes. I did not feel comfortable taking photos but I was able to snap a few entrees. 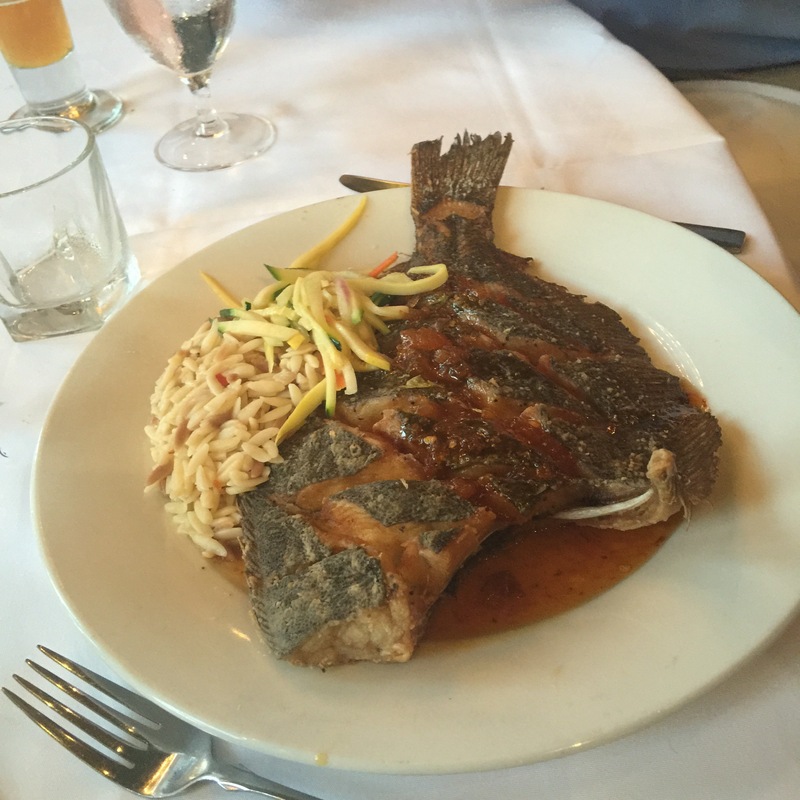 Crispy Diamond Scored Flounder with shallot sauce, orzo provencal. Yum! 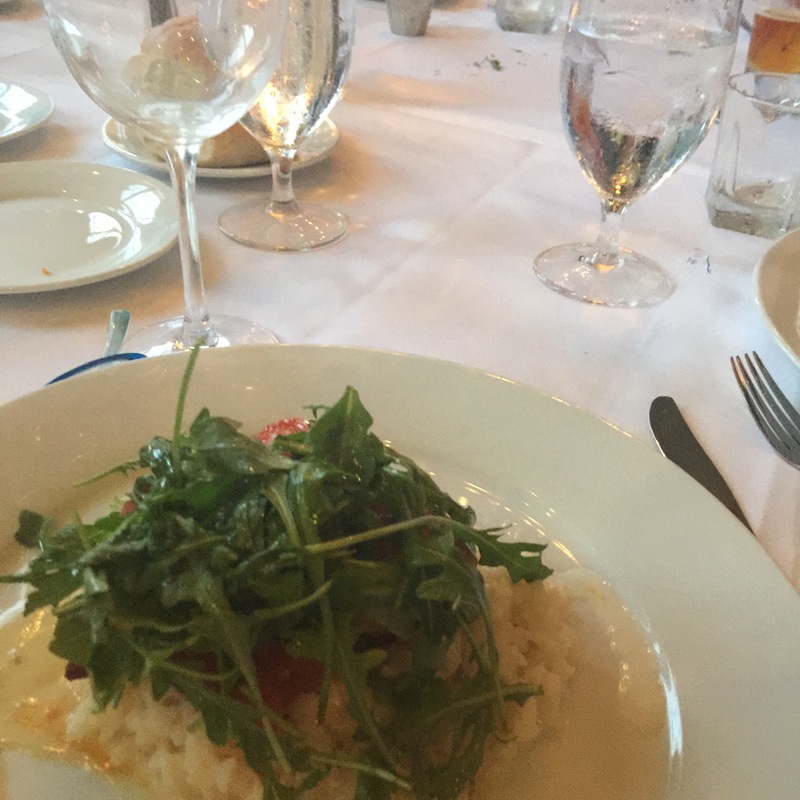 Grouper with crab and arugula on parmesan risotto. This was my yummy dish. It For appetizers; Calamari and the Crab Stuffed Mushrooms with Parmesan were both fantastic. There were seven desserts ordered. I never order desserts so this was a fun way to try little bites. The berry basket was really good! I loved the food here and absolutely will go back. Don’t feel intimidated by the beautiful décor, this write up says it best! “What I love about Garibaldi is its simple elegance. Diners are as comfortable in ties and jackets, as they are in shorts and polo shirts. 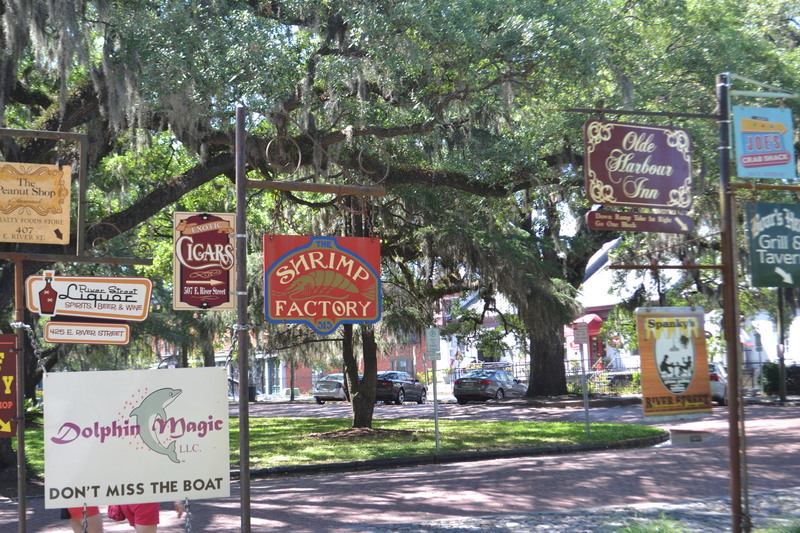 Whether for a special occasion or dinner after a day in city market, Garibaldi is a place to celebrate with food, fun and friends.” -Savannah Morning News . MEGastars 5***** Everything was perfect. Awesome service. Get the oysters with cilantro-lime vinegar. I would make a reservation to be sure. The upstairs is fantastic, bright and cheery and a bit quieter than the downstairs bar area. 2. Sorry Charlie’s Oyster Bar and cocktails. This is a new restaurant in a nicely renovated building. 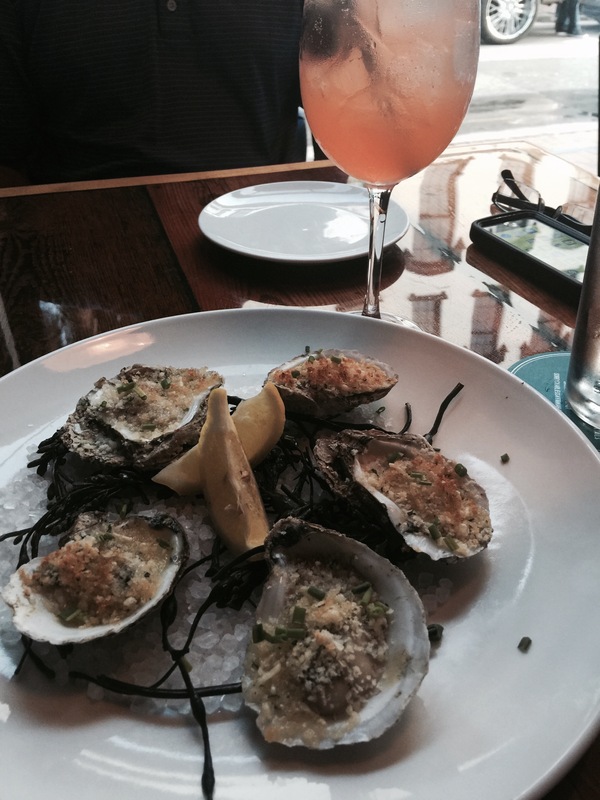 Described as “A Historic feel with forward thinking seafood.” Oysters vary daily as does the menu. I chose the Oysters Rockefeller; partly because the Nueske’s bacon is from my home state of Wisconsin. Petite Crab Cake with citrus sauce and wedges of grapefruit and orange. Blue crab bisque with black truffle cream, white truffle oil and chives. MEGastars 3.5 *** 1/2* The food was good but a few of the portions were small. The service was a bit slow but this is a new restaurant. However, I left with a $140.00 bill for two. I want something to rock my world. Try to get a table near the windows. Great watching! For oysters- I loved Girabaldi’s and The Grey! 3. Lady and Son’s. For those of you who do not know the story. Successful Savannah business woman, Paula Deen, along with her two sons, went from sandwich delivery, to catering, and then the restaurant business. Their success story helped make this family TV celebrities. The door says walk in’s are welcome. I popped in without a reservation (don’t do this) and was able to be seated at the bar on the third floor. Meh. The waiter gave a speech about the buffet. 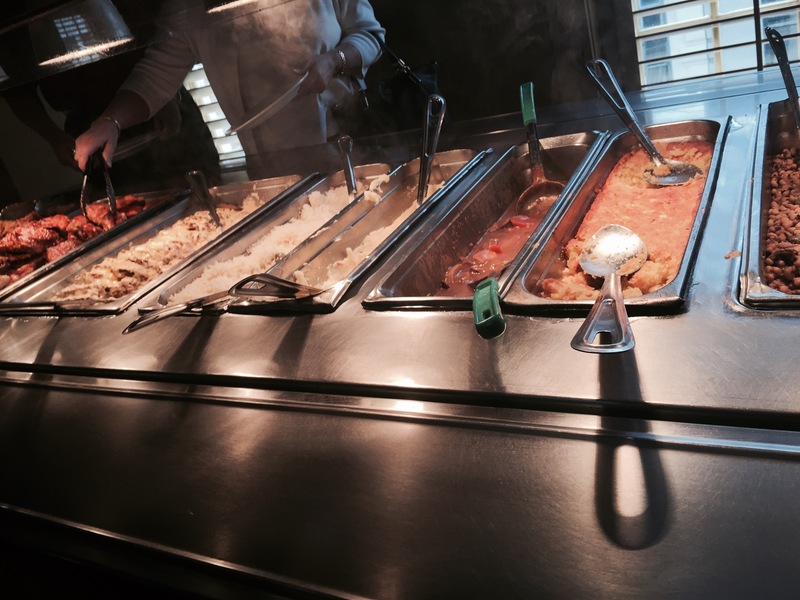 I did not see anything on the buffet that made me wiggle. At $16.00 for lunch buffet, I simply can’t binge eat anymore. If you have a large appetite or if you have never tried Southern cooking, this may be a good way to try these dishes. Described as Southern, American-Traditional food, there is a lot of hype around Paula Deen’s Restaurant. It was a fun try, glad I went there once. 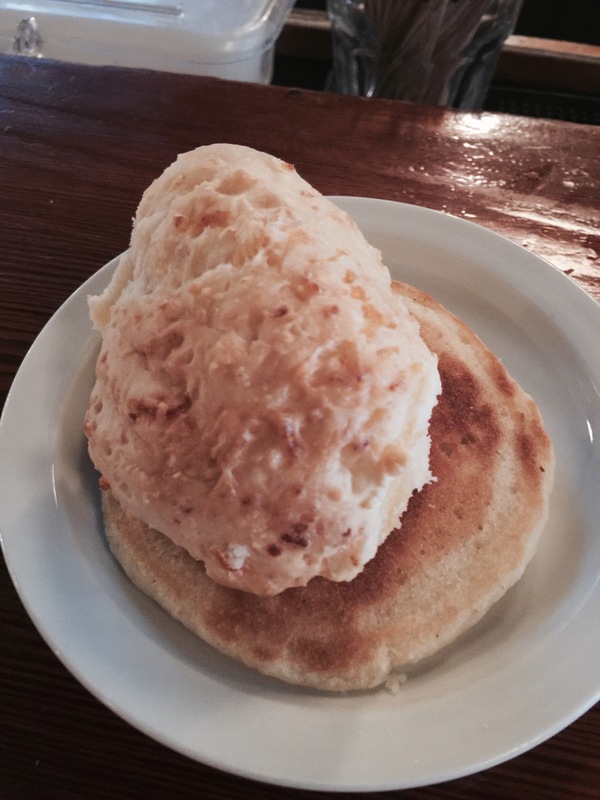 I was served a famous cheese biscuit with garlic butter and a hoecake while I waited for my order. And, I waited a really long time.It didn’t seem to go with my sandwich but I tried both and that biscuit was darn delicious. 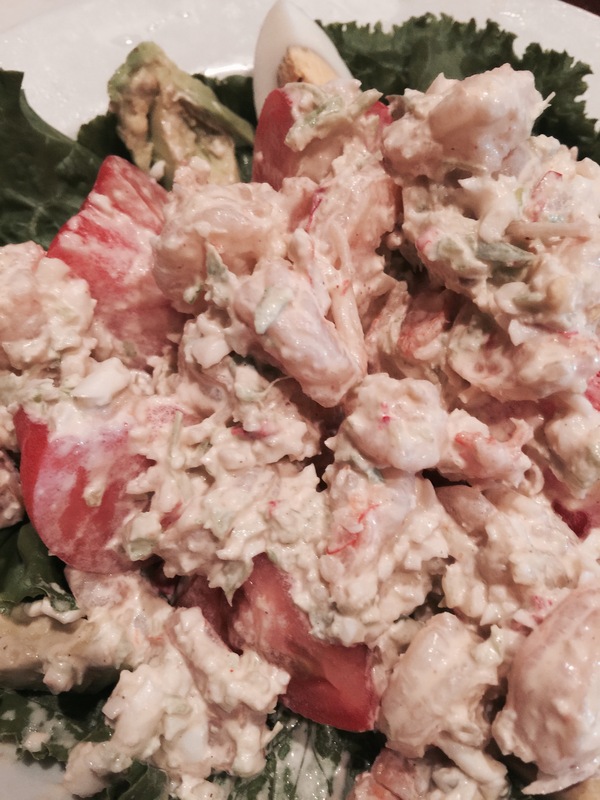 I ordered “The Bag Lady,” Choosing1/2 “Jamie’s Famous Chicken Salad” with a cup of The Crab Stew-rich creamy stew with succulent blue crab. For an upcharge of $3.00, I was able to try a few bites. .Go here if you are a fan of this famous cooking family. Read the reviews before you go, I agreed with most of them and this may help you choose your dish. Absolutely make reservations or be prepared for a wait. This is one busy place. 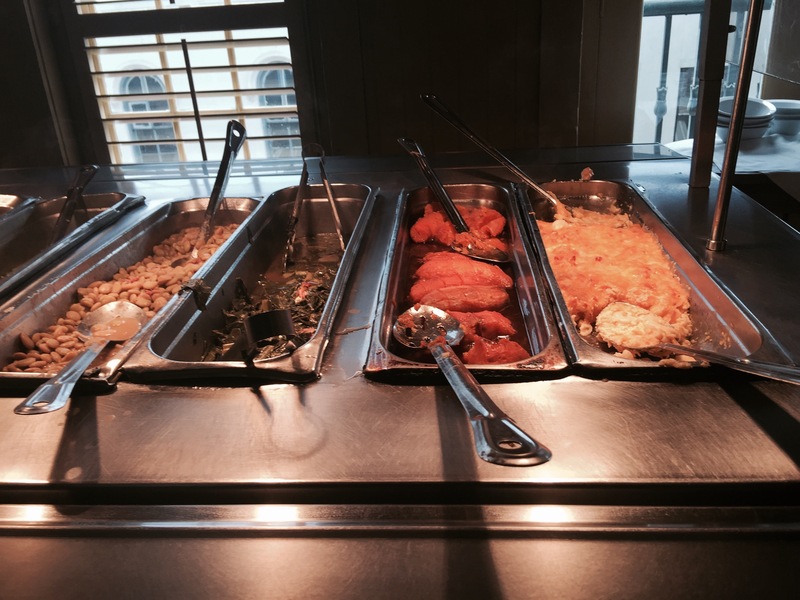 For Southern/Soul Food experience, I would give Mrs. Wilke’s Dining Room a try. Difficult to see-photo below. but there are LONG WAITS It rates really well for Southern Food as does Sister’s. 5. Fan of Midnight in the Garden of Good and Evil? 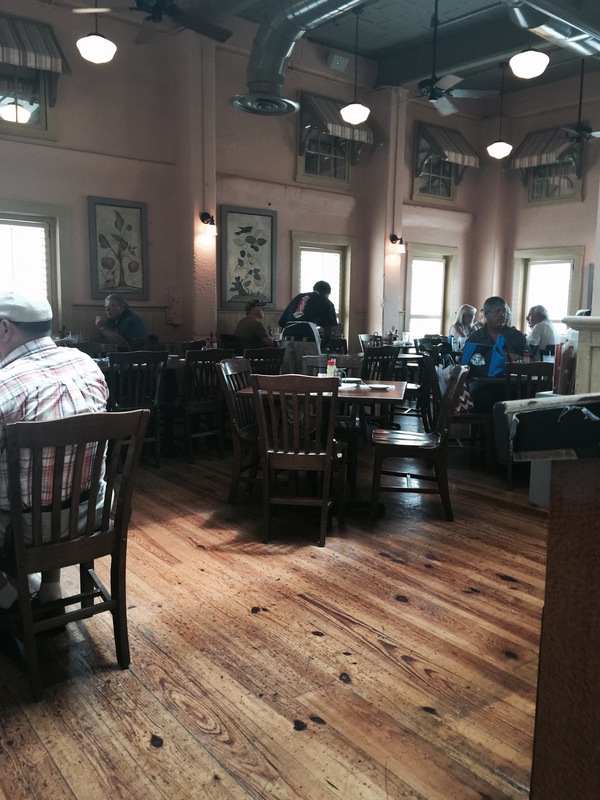 Go to Clary’s Cafe-They also have a really great breakfast menu. The Shrimp Factory-Over the years, I have eaten at most of the Riverfront Restaurants (P.B.-pre-blog and photo era.) Let’s say this is a busy spot with lots of visitors. 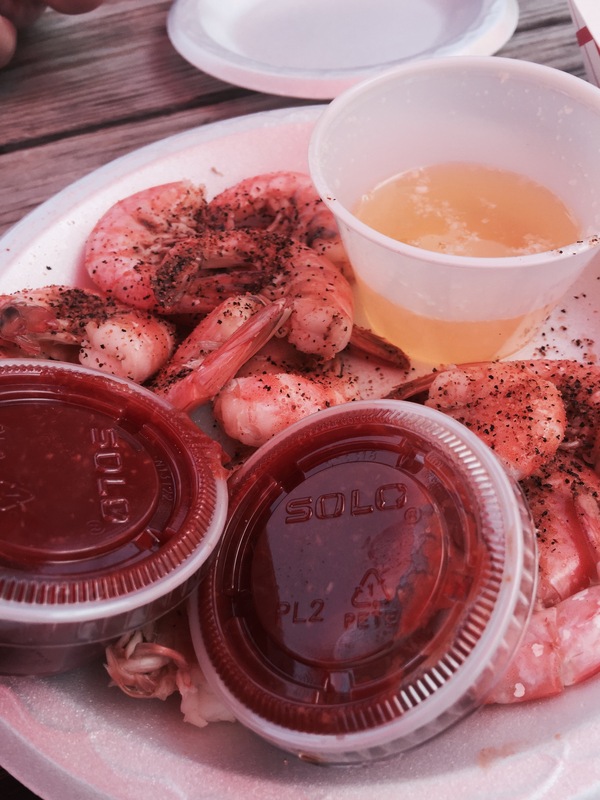 I gave The Shrimp Factory a whirl after seeing an ad at the Visitor’s Center. Ya know, it wasn’t too bad. 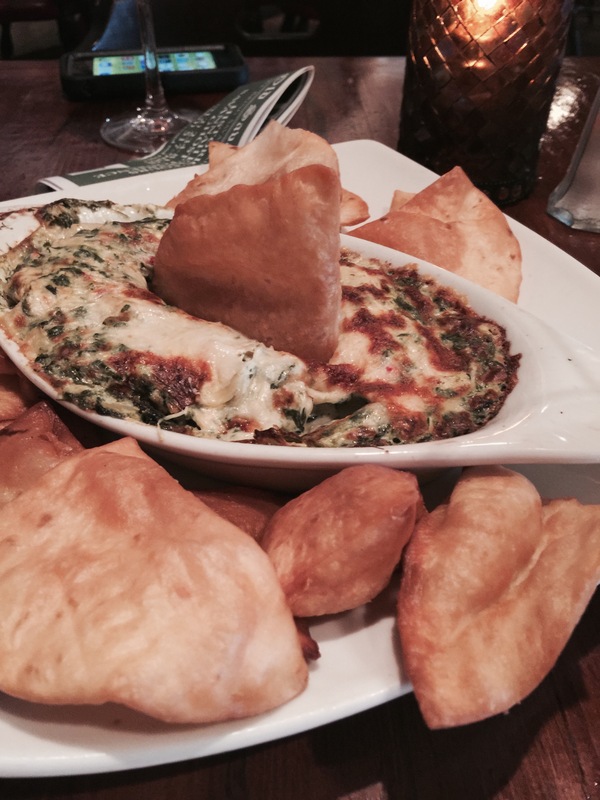 Started with Shrimp, Crab, Spinach and Artichoke dip. what can I say? Dig in! I had Shrimp Salad Stuffed Beefsteak Tomato;house made shrimp salad over a beefsteak tomato, served with sliced avocado and egg. 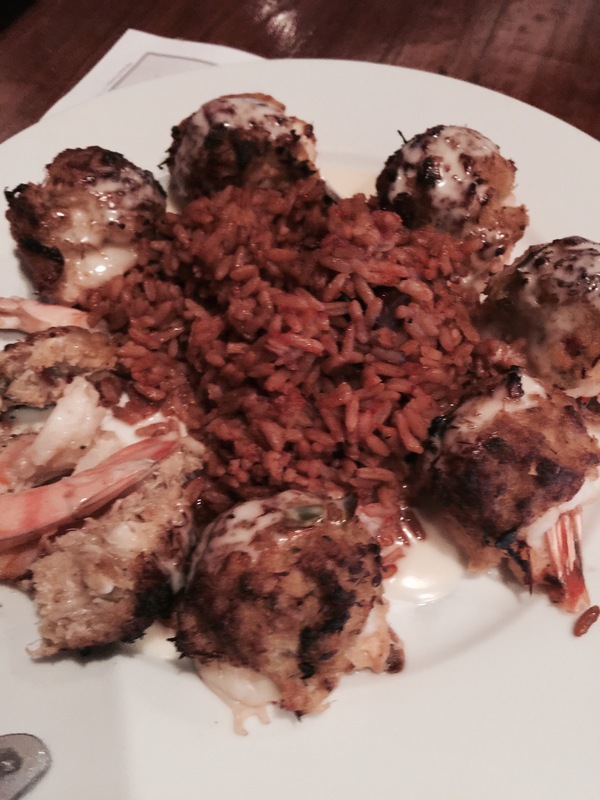 Loaded with shrimp, I loved it! So there is this drink called “Chatham Artillery Punch.” I had a really fun waitstaff, and of course they charmed me into tasting. I don’t like orange tea and was ready to not like it, Not bad and I got to check this off my “eat/drink” Savannah list. 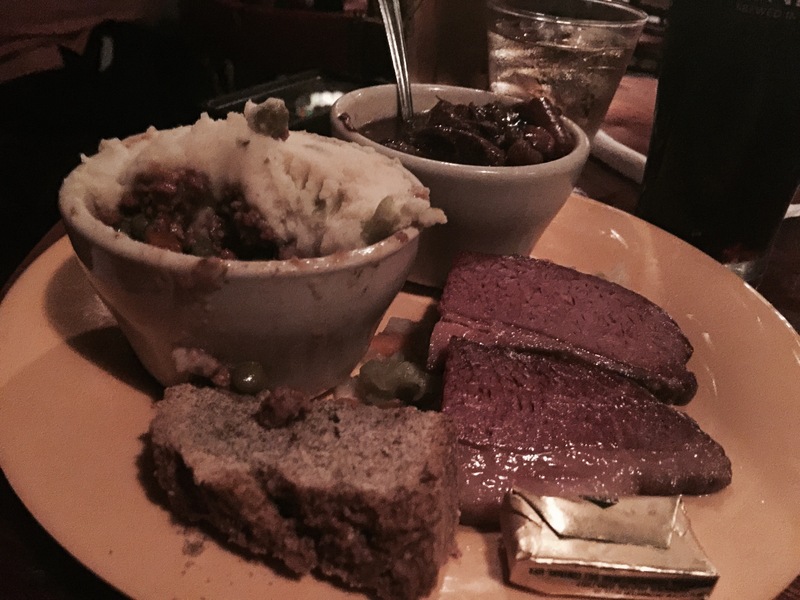 My husband chose “The Irish Sampler.” Beef Stew, Shepherd’s Pie, Cabbage and brown bread. They serve until 11 p.m. I give the food a 3 MEGastars*** It’s a pub, and it was late for a food order. 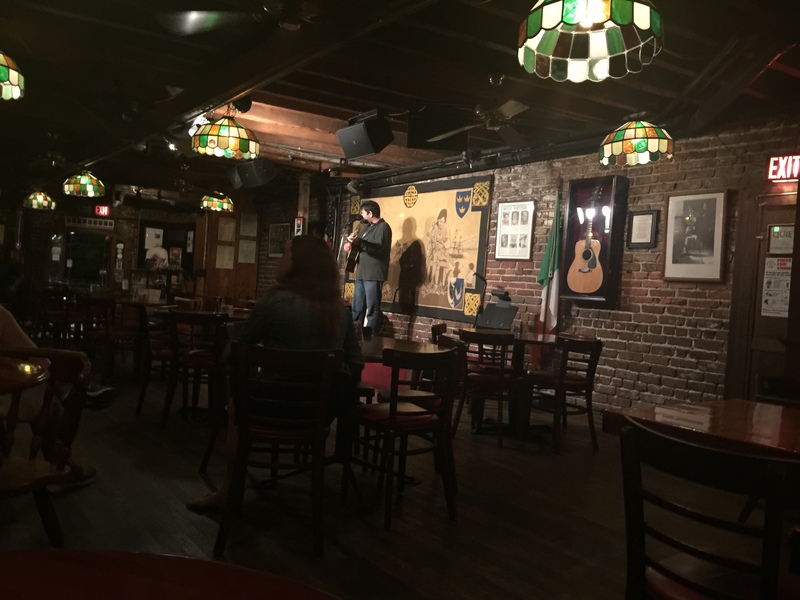 There was a lot of fun going on in this place. MEGatips-Need a party place to sing drunken tunes? Go here later in the evening. 6. The Cafe at City Market for that Peach Sangria-I have eaten at all of The City Market Restaurants. It’s a fun place to sit outside, people watch and listen to live music. I want to mention one menu item. The BEST drink in town is found here. 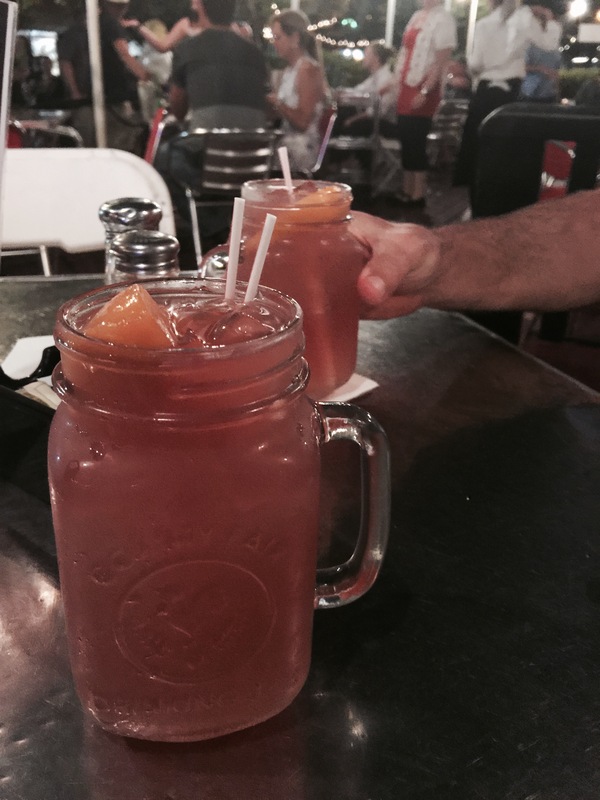 This peach sangria is magical and you can have these to go. Yep Savannah rides the fun bus. 7. 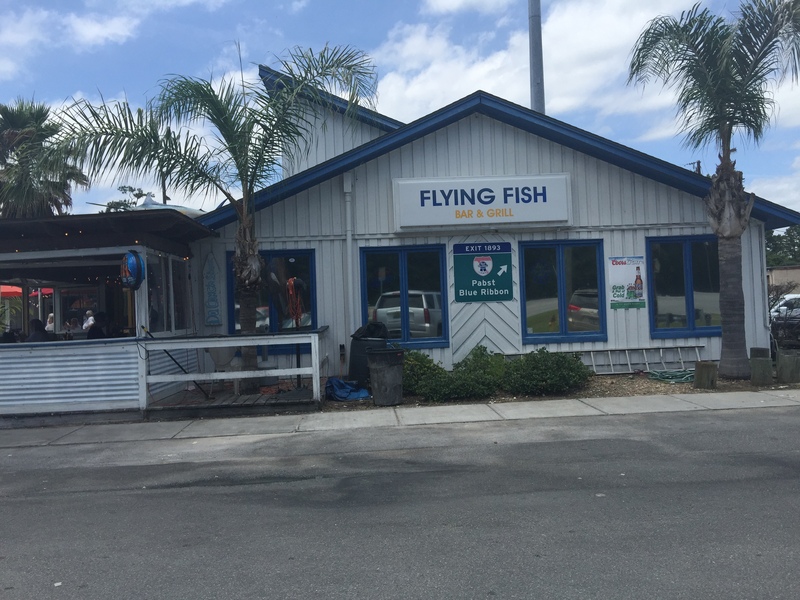 The Flying fish Bar and Grill-An inside tip from my friend who lives in Savannah.Outside of the downtown and on the way to Tybee Island ,this is an easy stop. Fresh shrimp in a super relaxed spot. They will fresh your catch. Good seafood menu at a fair price point. Savannah You Rocked My Palate! Best place for a burger and a brew. I like The Moon River Brewery. *****MEGastars They have a great menu with super choices, such as grassfed beef. Other reasons to visit. 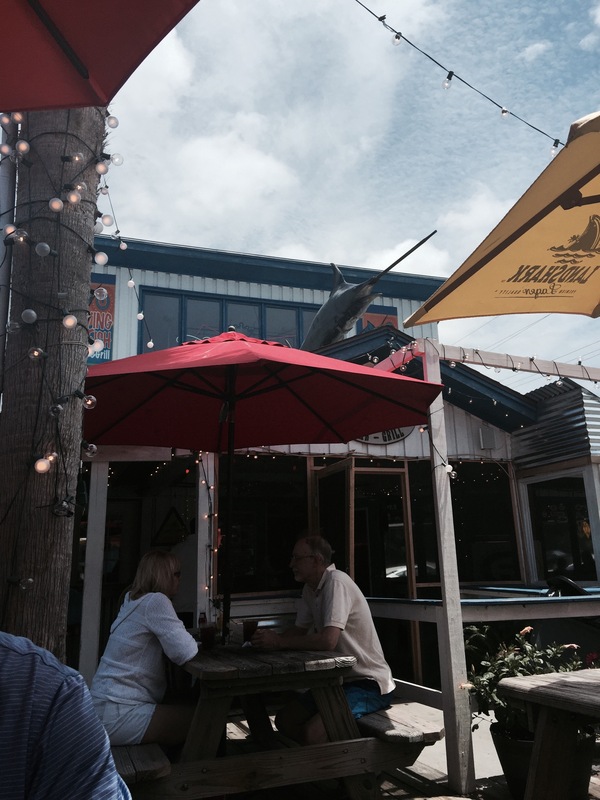 It reportedly has a ghost and there is a new 5400 square foot outdoor beer garden. 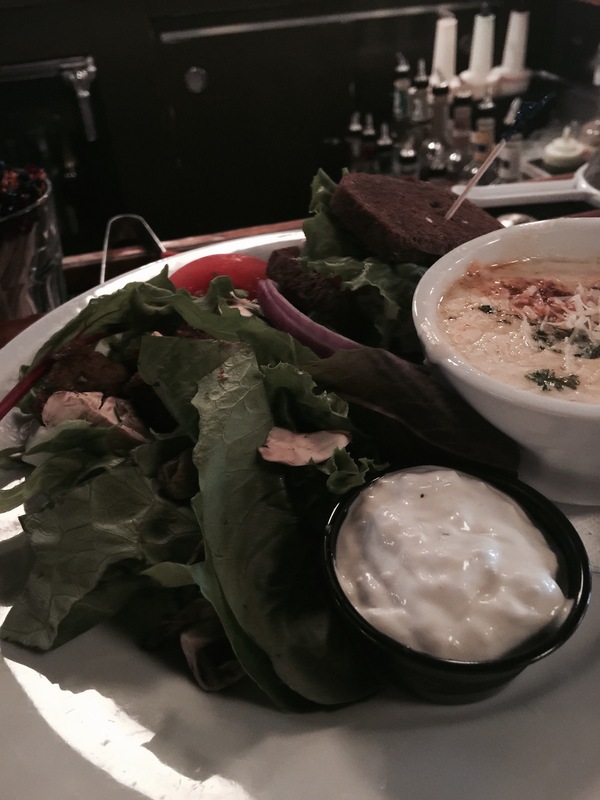 MEGatip; They have these smoked Gouda Scalloped potatoes that are to die for. 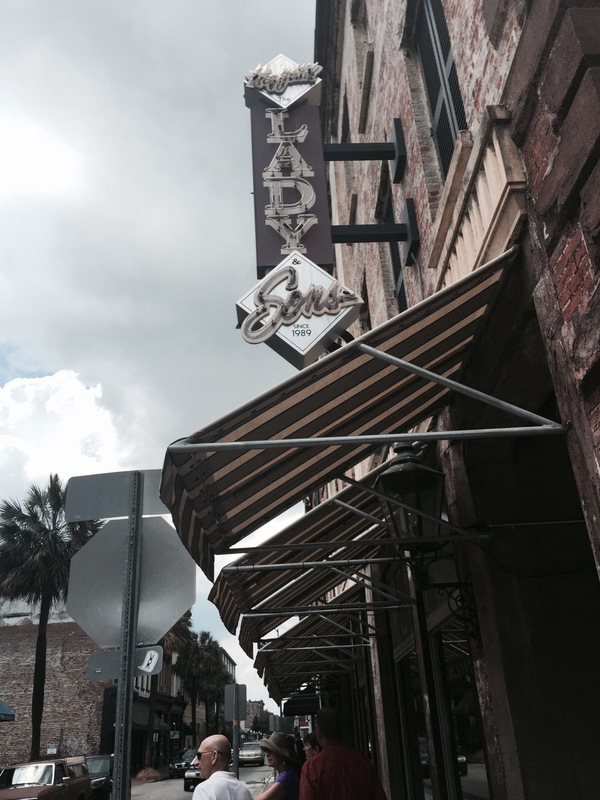 Another great spot for a brew is The Distillery near SCAD and the Vistor Center. This is within walking distance to the downtown area. 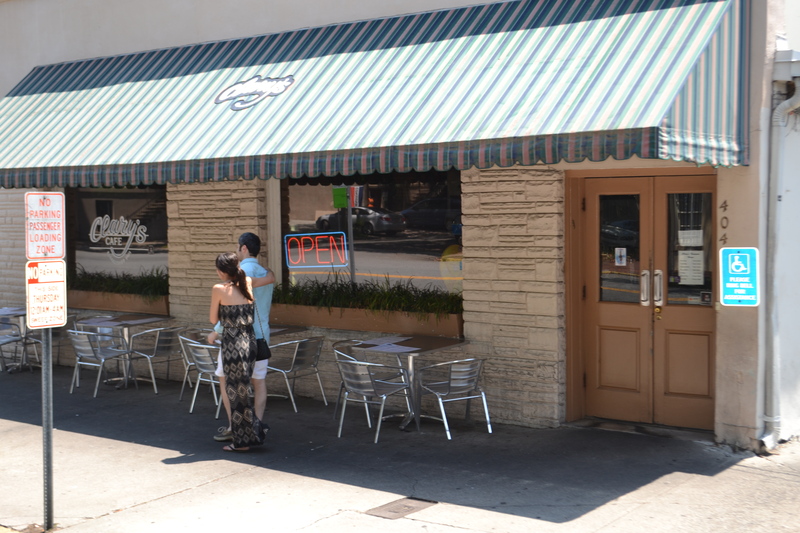 ***** There is a small outdoor seating area. Their motto “No Crap Just Craft.” I like these folks. MEGatip; get the Deep Fried Moonpie.